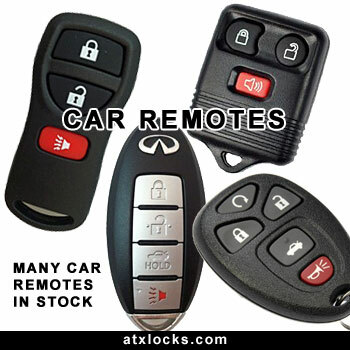 ATX Round Rock Locksmith service is your best choice for all your transponder car keys, Remote head keys, Prox keys, Car remotes and more. It is very common for people to miss place or end up with a lost car key or have the key break in the door or ignition. Don't worry we can help. We have all the latest tools needed to originate a new working key for your car including doing all the key programming that is needed for transponder car keys or chip keys. We can do new car dealer level key programming and stock a wide range of keys, remote head keys, Car remotes and more for all the most common cars and many of the not so common cars on the road today. Transponder keys also known as chip keys or Smart keys are the most used key nowadays for most cars. We have Round Rock transponder keys that cover all the major car manufacturers so if you have lost your key or just need an extra transponder key made we most likely have the key you need. We have everything from the Detroit giants like Ford, Lincoln, Mercury, Chrysler, Dodge, Jeep, Chevy, GM, Buick, Cadillac, Pontiac, Oldsmobile, Saturn, and more to some of the other popular brands like Toyota, Lexus, Honda, Acura, Mitsubishi, Hyundai, Infniti, Isuzu, Kia, Mazda, Nissan and VW. Nowadays many cars come with a remote head key in that the remote is built right into the head of the key. 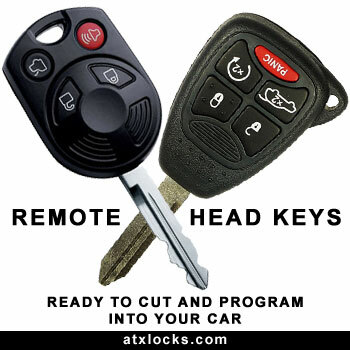 We are your Austin and Round Rock remote head key supplier. We have in stock most all of the common remote head keys for today's modern cars including remote head keys for Chrysler, Dodge, Jeep, Ford, Lincoln, Mercury, Toyota, Lexus, Honda, Mitsubishi and more. If we do not have the remote head key for your car in stock we will get it for you within 24 to 48 hours. We cut and do all the remote head key programming right on location at your car. 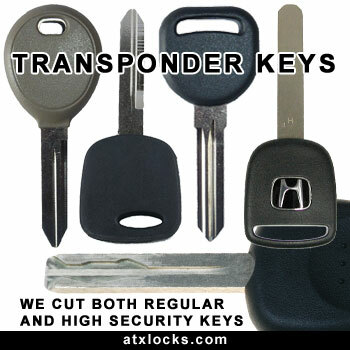 If your looking for a remote head key in the Austin TX area give us a call we can help you out. Many of the newer Chrysler, Dodge and Jeep vehicles use what is called a Fobik to start the car. The Fobik keys come in many styles and many button set ups. It is very important that you use the right Fobik for your make model and year car, truck or van or it won't work. I have customers call me all the time that have ordered a Fobik from places like Ebay or other websites and want me to program it into their car and as soon as they bring the car and the Fobik to me i can see they do not have the right one and it will not program in and work for the car so they just lost the money they paid for it. Many of them look the same but will not work from one year or from one model to another. We have the right Round Rock Fobik key you need and do all the programming so it is working for your car. We have in stock 3, 4, 5 and 6 button Fobik keys and all the different versions of each one including the ones for Mini vans. 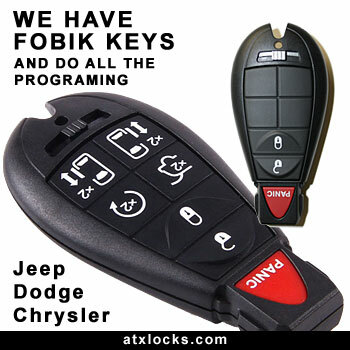 If you are looking for a Fobik key in the Austin area we have them. We also have the emergency key that is a lower cost version of the Fobik that will start your car and get you back on the road at a lower price cost if needed. Lost or broke your car remote? Or is your remote just worn out and you need a new one? ATX Round Rock locksmith Service can help. We keep in stock all the most common car remotes and have them available for you. We also provide the remote programming into your car. Because there are so many remotes for so many years, brands and makes of cars it is impossible for us to have them all but we if do not have it we can get it for you within a few days and do the remote programming for you as well.